Nice to Meet You is a book of family photographs, except that sometimes, the people in them aren’t family. 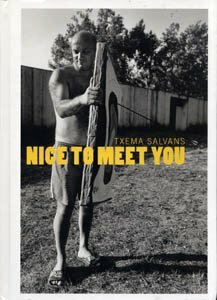 Photographer Txema Salvans seeks to explain, through people’s interaction, the quotidian in a culture and a way of being and living that is 'Mediterranean'-direct, close, sincere. Nice to Meet You also references a form of work in which Salvans does not impose his presence, but is accepted by the system or the personages he wants to photograph. A brief text by journalist Guillem Martinez precedes each group of rich black and white images, and provides a guide to understanding the following scene-through them readers are invited to delve into the family logic of families that have, perhaps, never happened.